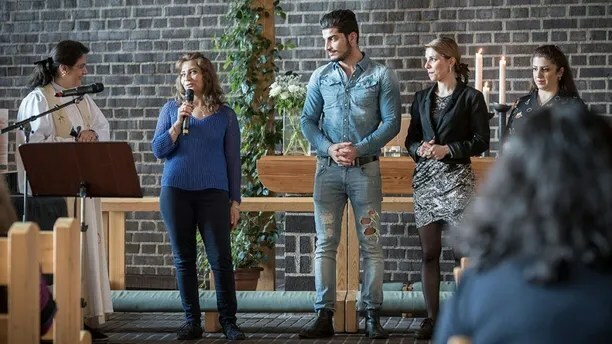 Annahita Parsan (left) has converted hundreds of Muslims in Europe to Christianity. Annahita Parsan is an ordained minister in the Church of Sweden. She is the author of Stranger No More: A Muslim Refugee’s Harrowing Escape, Miraculous Rescue, and the Quiet Call of Jesus (Thomas Nelson). (…continued) Today, at my church in Sweden, I have the privilege of seeing God powerfully at work in the lives of so many Muslims. All over the world, God is appearing in dreams and visions to men and women who have previously followed Allah. But God continues to work at a slower pace as well. Two summers ago, as the news brought constant stories of refugees climbing on boats and hoping to make it to Greece, I was asked to pray with a man who had walked into my church. His name was Fiaz, and he told me about the night that he, his wife, and two daughters stood on the shore in Turkey and watched the boats approach. The flashlights were weak, and the waves crashing on the rocks were strong. He scooped up his little girls and called to his wife to follow. Only when they had pushed away from the shore did Fiaz discover that his wife had not made it on board. There were other boats, he told himself. She could have gotten on one of them. When they landed he searched frantically, up and down the coast. It took nine months for Fiaz to discover the truth. His wife had fallen down in the push to climb on board. She had drowned right there, just a few feet away. She was 23. “Only God can heal you,” I said, as Fiaz and I stood before the cross. “Open up your heart to him.” He let out a cry so raw, so loud, and so full of the deepest, darkest pain. It was like my own cry in the mountains—a raging against evil. The next week, Fiaz and his daughters moved in with a family from church. There will be no quick fixes and no simple solutions. But God will be with them, guiding them, leading and loving them. He will call them back to him again and again. All they have to do is say yes. I Peter 5:10 — The God of all grace, who called you to his eternal glory in Christ, after you have suffered a little while, will himself restore you and make you strong, firm and steadfast.